Existence of distributional solutions of a modified surface quasi-geostrophic equation is proved for \(\mu \)-almost every initial condition, where \(\mu \) is a suitable Gaussian measure. The result is the by-product of existence of a stationary solution with white noise marginal. This solution is constructed as a limit of random point vortices, uniformly distributed and rescaled according to the Central Limit Theorem. 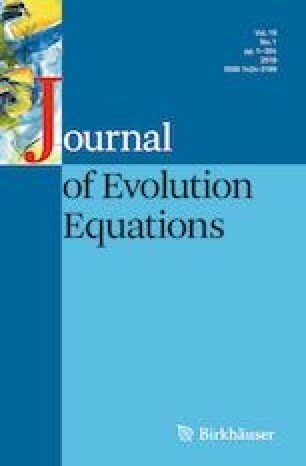 T. Buckmaster, A. Nahmod, G. Staffilani, K. Widmayer, The Surface Quasi-geostrophic Equation With Random Diffusion, to appear in International Mathematics Research Notices (2018), https://doi.org/10.1093/imrn/rny261. T. Buckmaster, S. Shkoller, V. Vicol, Nonuniqueness of weak solutions to the SQG equation, arXiv:1610.00676 (2016). A. Castro, D. Córdoba, J. Gómez-Serrano, Global smooth solutions for the inviscid SQG equation, arXiv:1603.03325v3 (2017). F. Flandoli, Weak vorticity formulation of 2D Euler equations with white noise initial condition, arXiv:1707.08068 (2017), to appear on Comm. PDEs. C. Geldhauser, M. Romito, Limit theorems and fluctuations for point vortices of generalized Euler equations, arXiv:1810.12706 (2018). C. Geldhauser, M. Romito, Point vortices for inviscid generalized surface quasi-geostrophic models, arXiv:1812.05166 (2018). P. Isett, V. Vicol, Hölder Continuous Solutions of Active Scalar Equations, Ann. PDE 1 (2015), no. 1, Art. 2, 77 pp, https://doi.org/10.1007/s40818-015-0002-0. A. Kiselev, Y. Yao, A. Zlatoš, Local regularity for the modified SQG patch equation, arXiv:1508.07611 (2015). C. Marchioro, M. Pulvirenti, Mathematical theory of incompressible nonviscous fluids, volume 96 of Applied Mathematical Sciences, Springer-Verlag, New York, 1994, https://doi.org/10.1007/978-1-4612-4284-0. J. Pedlosky. Geophysical Fluid Dynamics. Second Edition, Springer-Verlag, New York, 1987, https://doi.org/10.1007/978-1-4612-4650-3. S. Resnick, Dynamical Problems in Nonlinear Advective Partial Differential Equations, Ph. D. thesis University of Chicago, available at https://search.proquest.com/docview/304242616?accountid=14527. K. S. Smith, G. Boccaletti, C. C. Henning, I. Marinov, C. Y. Tam, I. M. Held, G. K. Vallis, Turbulent diffusion in the geostrophic inverse cascade, J. Fluid Mech. 469 (202), 13–48, https://doi.org/10.1017/S002211200200176.